ELIZABETH CITY, N.C. – Make sure you mark November 13th on your calendars. 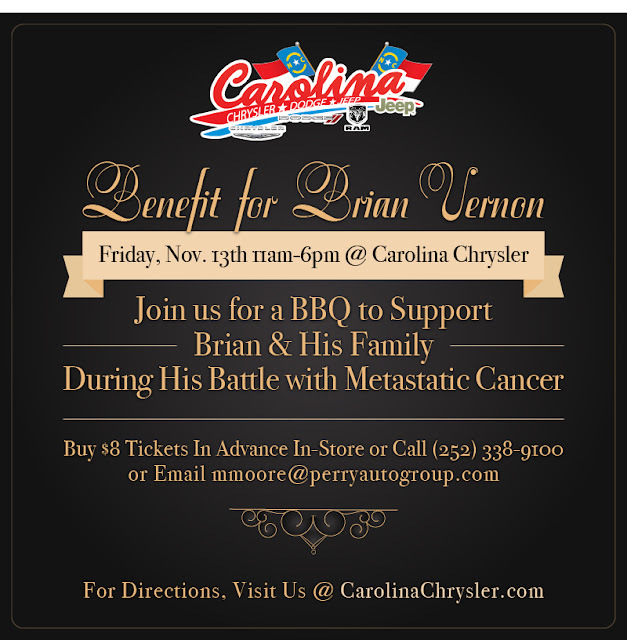 Carolina Chrysler will be hosting a BBQ benefit for Brian Vernon and his family. Brian Vernon is one of our service advisors here at Carolina Chrysler and only good things can be said about him. Unfortunately, he’s battling metastatic cancer so we need to show our support and help him and his family. The BBQ benefit for Brian Vernon will be going on November 13th from 11 a.m. to 6 p.m. You can look forward to eating fried chicken, BBQ, sliced potatoes, green beans, and hush puppies. Captain Bob’s will cater all of this delicious food. All proceeds are going to Brian and his family to help them through this hard time. Please come out and help a great member of our community. Perry Auto Group has a great team of service specialists at our Chrysler dealer near Corolla, NC. They’ll take great care of your brakes, tires, and any other car parts. Make an appointment with us online to get your auto service taken care of.